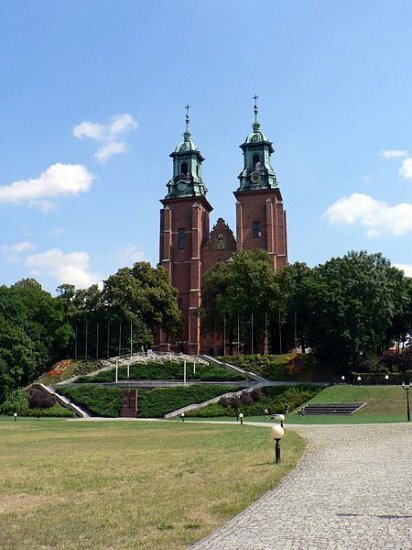 Gniezno’s Cathedral, the final resting place of (parts of) Poland's patron saint, St. Adalbert, is also regarded as the spiritual home of Poland’s former monarchy. 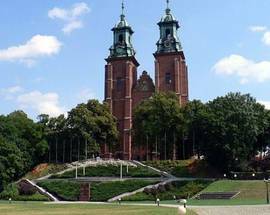 Built by the first official ruler of Poland, Mieszko I, not long after his 966 baptism, it’s here that Poland’s first five kings were crowned (Mieszko, despite being the official first ruler of Poland, was not a crowned king). 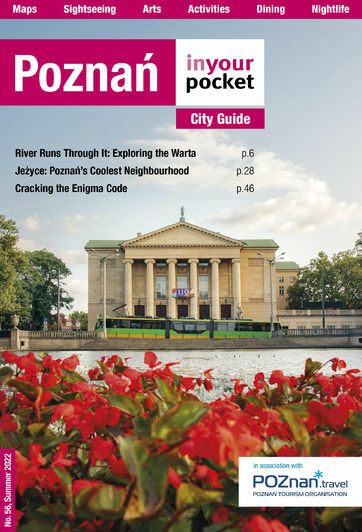 To truly enjoy it, two visits are required; a guided tour sees all manner of stories and legends revealed, and will grant you access to the 'Gniezno doors' and the crypt, while a follow up solo tour allows you to really take stock of the riches and relics before you. Note that sightseeing is not possible on Sundays. 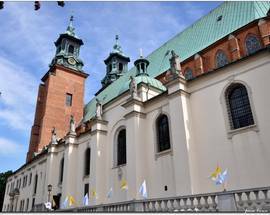 Ask anyone and they’ll tell you the principal highlight of the Cathedral is the Gniezno doors, a pair of winged bronze doors from the 12th century where you naturally begin your tour. The doors feature 18 panels, each masterfully engraved with scenes from the life of St. Adalbert of Prague, a 10th-century Czech missionary and eventual martyr who served as the bishop of Gniezno for a short period of time. Of note are an exorcism illustrated on the sixth panel and his murder on the fourteenth and fifteenth - yep, that’s his head on a stick. Worthy of further investigation in also the portal that frames the doors, a 1400 creation featuring an engraving of Jesus sitting on a rainbow (believed to mark the entrance to heaven) with two swords in his mouth - symbolic of the power he wields both in heaven and on Earth. Next up is a trip to the crypt - the highlights of which include Poland’s oldest gravestone, the coffins of the country’s past primates (the bishop variety, not mere placental mammals), and the pattern of the tiled floor (which also appears on the 10zł note) - before onto the Cathedral proper. 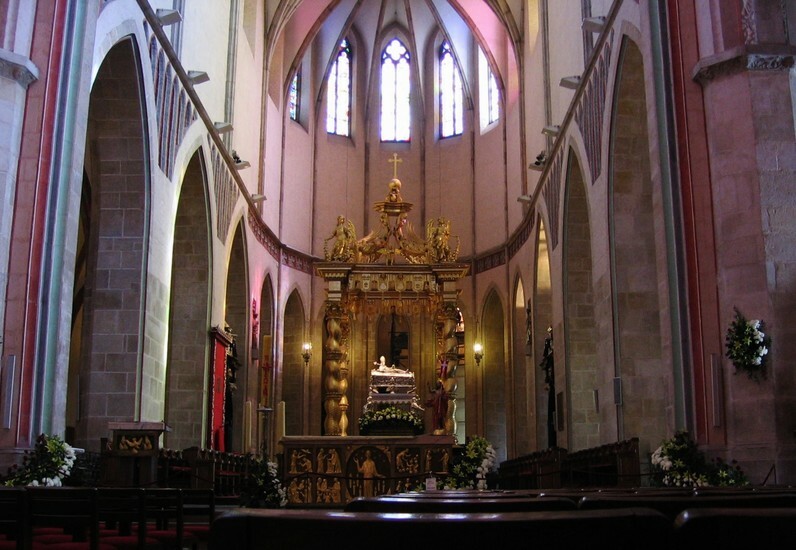 The most recent, Gothic iteration was built between 1342 and 1390 and embellished over the course of time, and nowadays it is the Baroque flourishes that steal the show. It’s impossible to put a figure on the number of must-see details, and it’s at this stage where having a guide becomes invaluable. The 13 arcades around the presbytery are symbolic of Jesus and the 12 apostles, and there’s a heavy emphasis on allegorical symbolism. At the rear of the Cathedral you can spot one of only two works by Wit Stwosz found outside Kraków. In total the Cathedral is surrounded by 13 side chapels holding a number of points of interest, including a miracle working crucifix found in the Chapel of Jesus. The cross has accompanied the Polish army into battle since the 17th century when it was first seen to bleed. The elaborate gold 'confessio' of St. Adalbert, situated at the top end of the Cathedral, is stunning, and said to be modelled on the tomb of St. Peter in Rome. Beneath it is a silver sarcophagus, designed by Gdańsk master craftsman Peter van Rennen and carried on the figures of a priest, peasant, townsperson, and knight. Considered the most important relic in the country, the silver coffin contains parts of the saint's body which escaped numerous lootings, including the daring Czech assault in 1038 (the same invasion that caused Gniezno to lose its capital status), which saw many of St. Adalbert's remains transported to the cathedral in Prague. Unfortunately visitors are denied the opportunity to view the library. 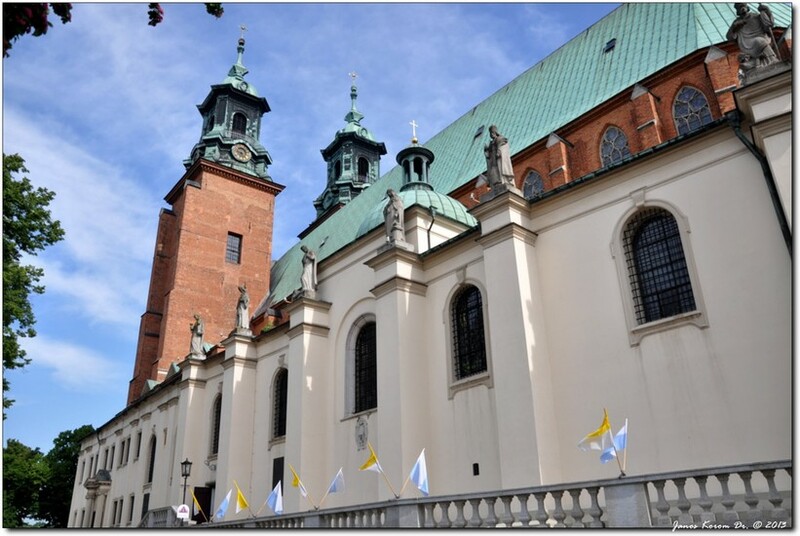 Treasures here include Poland’s oldest book (dating from 880 AD), a papal edict that features the first recorded use of the Polish language, and numerous letters penned by Poland’s former regents. Though frustrating, this locked door policy is fully understandable. The Cathedral has had misfortune served up in spades. Its significance to the Polish state has not been lost on invaders and as a result it’s been burned, looted, battered, and destroyed on numerous occasions. Napoleon’s troops turned it into a stable, while the ‘liberating’ Red Army shelled it for no apparent reason. The Nazis, meanwhile, replaced St. Adalbert’s portrait with that of Hitler and planned to use the building as a concert venue for high-ranking fascists. Legend goes, however, that on opening night a bishop drifted unannounced across the hall and disappeared into the crypt below. Shots were fired at the unannounced gatecrasher, but none hit their mark, spooking the Nazis enough to scrap their plans and not set foot inside again. Unfortunately this didn’t stop them from employing Volksdeutsch workers and systematically stripping the building of its valuables, melting the gold and shipping off countless treasures to shady vaults. Only the confessio and the organ escaped them - the latter only to be blown up by the Soviets in 1945. 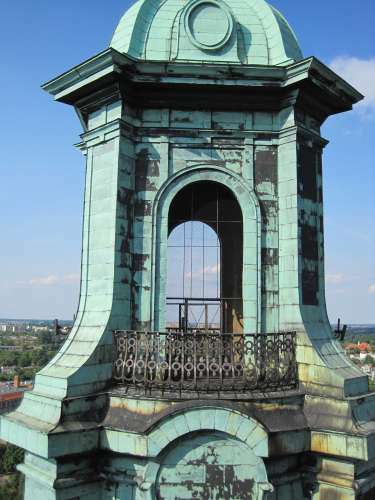 The bell tower shared the same fate, which explains why you’ll see the original bell lying outside the main entrance. Rebuilt (with no bell) the bell tower is open in the summer season, and its 231 steps lead to panoramic views across town. Last entrance 30min before closing. 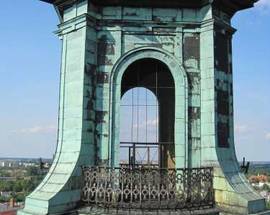 Admission requires 3 tickets to see the Cathedral's 3 highlights: bell tower 4/2zł (summer only), underground 5/3zł (guide included), doors 6/4zł (guide included); or buy a combined ticket which also includes an audioguide and entry to the Archdiocese Museum for 21/11zł. 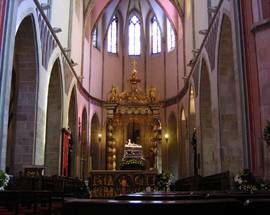 A live guide taking you around the whole Cathedral will set you back 80zł.